Jessica Hannig is a somewhat dedicated senior at Jacksonville High School. 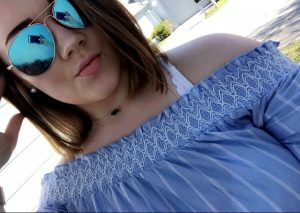 She enjoys spending time with her teammates at volleyball, attending and supporting Crimson clubs and sports, and watching Friends while not being with her own. As her senior year has quickly arrived, she wishes to leave Illinois and attend either Iowa State University or University of Nebraska-Omaha. On the weekends, you will see her as a waitress at Mangia’s Restaurant and Bar in Jacksonville. Jessica joined journalism because she is still undecided about her college major in the fall. Therefore, she is testing the waters in several classes, hoping to find something that sparks her interest. The past three summers, Jessica has spent the majority of her time at Knight’s Action Park as a lifeguard while also babysitting her younger cousins. Other than volleyball and work, Jessica went to Iowa for a week this summer and was able to see several country music artists including Jake Owen, LANCO, Chris Janson, and more. Concerts are a crucial part of Jessica’s summer to declare it successful. All in all, Jessica is a small town girl who cannot wait to get out of Jacksonville and take on the world somewhere else.